Thanks to the Conservative-led Government’s Local Transport Plan Settlement for Reading, our town’s roads are benefiting from £1.38 million investment. In lower Caversham earlier this summer, resurfacing took place in Hemdean and Gosbrook Road. Now in Caversham Heights we are about to benefit from a share of the £368,000 programme of resurfacing residential streets and minor roads (part of the £1.38m). Twenty-seven minor roads and residential streets' surfaces are to be renewed to improve routes for drivers, pedestrians, cyclists and motorcyclists. The minor roads surfacing programme will begin on Monday, September 8, and is planned to run until Saturday, September 20. Any required road-marking and ironwork adjustment will follow during the two weeks after surfacing work. In Woodcote Way, between Geoffreyson and the junction with the Upper Woodcote Roads, surfacing work is schedule for Friday 12 September. This follows the recent work to seal the joints using a bituminous material with fine aggregate over the top to provide grip. I’m advised that on the 12th a 12 mm thick micro asphalt layer will be used to seal the road, giving a finish similar to the top part of Woodcote Way which was done last year. Road-marking is due to be carried out approximately seven days later when ironworks will also be raised. The section of Woodcote Way will be closed during surfacing work with temporary parking restrictions in place. St Peter’s Avenue, between Highmoor Road and Kelmscott Close is also scheduled to be resurfaced on 12 September though the work is anticipated to take two days rather than just one. Road-marking is due to be carried out approximately seven days later when ironworks will also be raised. The road will be closed during surfacing work with temporary parking restrictions in force. 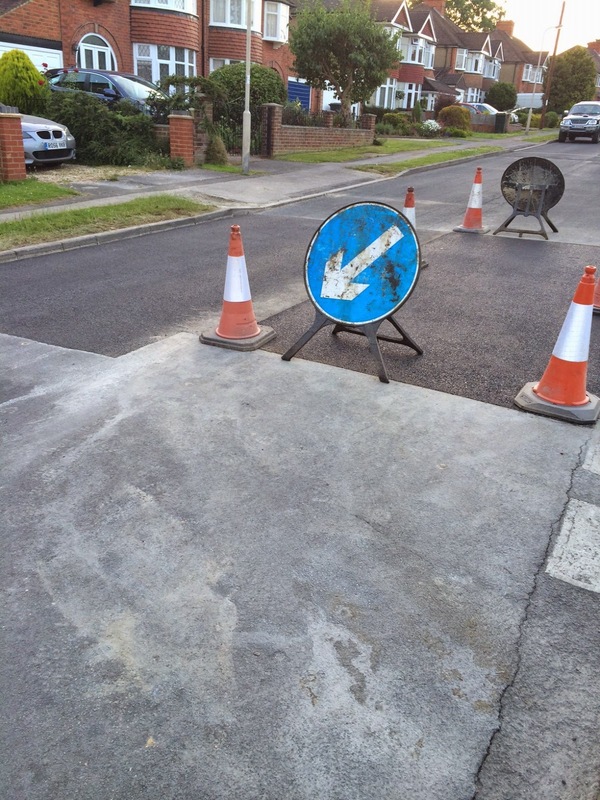 A couple of months ago I was pleased that my persistence in repeatedly reporting a pronounced dip near number 47 Woodcote Way paid off and the remedial work necessary was carried out. Concrete was pumped underneath the concrete slab which alleviated some of the problem to a point with the slab no longer moving when buses went over it. This enabled the council's contractors to build up the road and reset the kerbs on the side of the road. If you have a particular bugbear with any of the local roads do let me know so I can do my best to exert pressure on Reading Borough Council to sort it out. A full list of the roads included in this phase of resurfacing works can be found here.